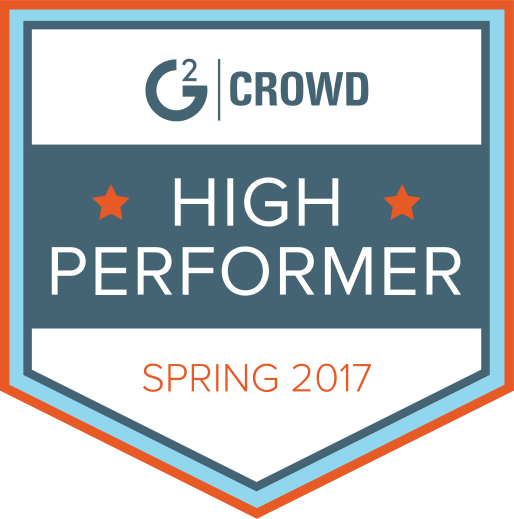 In addition to guest posting on the UpCity blog, Group3 Communications is featured as one of the Top Content Marketing Agencies in Raleigh. Check out their profile here. Ten years ago, medical practices could count on new patients coming from physician referrals and word of mouth marketing. Today, patient acquisition is much more complex and nuanced. Skyrocketing healthcare costs and high deductible health insurance plans, along with the evolution of technology, are causing the healthcare industry to shift and evolve like never before. Kaiser Family Foundation (KFF) reports that 43% of adults with health insurance have difficulty affording their deductible, and 29% of Americans report problems paying medical bills. As many as 27% who have issues affording healthcare have delayed or skipped care due to costs in the past year. These financial realities have reshaped the way Americans perceive healthcare and led them to become consumers of the industry. At the same time, the use of technology has grown exponentially. As of November 2016, 69% of Americans used social media vs. the 5% in 2005 according to Pew Research Center. In fact, 75% of users check their social media outlet at least once a day, and a 2013 study discovered that seven in 10 internet users look online for answers to health questions. 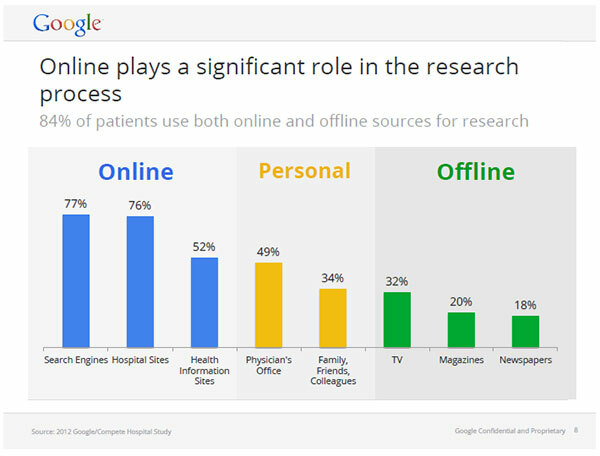 Furthermore, Google conducted a survey that found 94% of patients believe reputation is crucial in selecting a healthcare facility and that the majority of patients go online to research facilities. As competition among practices intensifies and patients become more reliant on online sources, medical practices and providers have an excellent opportunity to modernize marketing efforts like other industries. A quality content experience can help increase referrals and patient retention while driving patient engagement in meaningful ways. A medical practice must first understand its patient base or ideal patient base and align its marketing with patients’ needs before it can build a successful strategy. 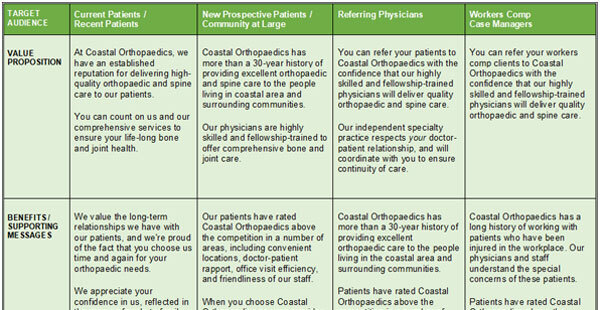 Medical practices can use a strategic matrix to track specific audiences and customized messaging. Take a big picture view of your patients, and consider the different elements of their background such as age, conditions, socioeconomic status, location and other relevant demographics. Determine what information or specific needs these patients want from a practice, and personalize quality content that will appeal to them. Be sure to document your strategy, so your practice’s leadership and marketing will be informed on the target audiences and customized messaging. See table above. Whether you’re a new solo-practice or a large practice with multiple offices, it’s important to set specific goals that will inform your content strategy and establish how your success will be determined. For instance, a practice focusing on brand awareness will have much different approach than a practice focusing solely on increasing appointments. 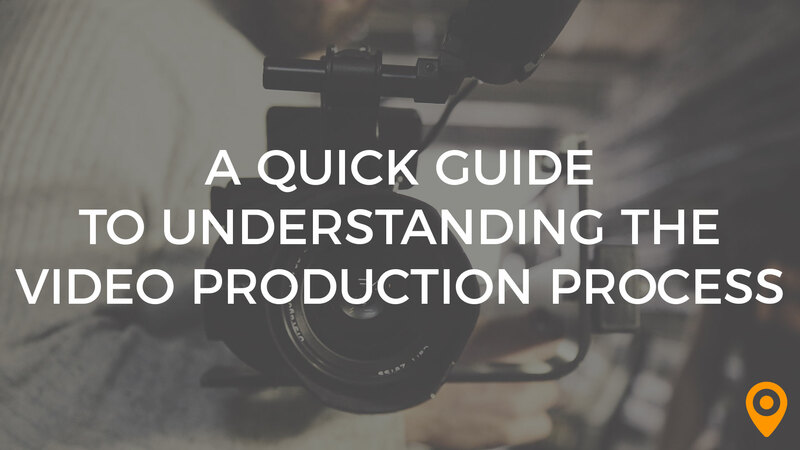 Determine which key performance indicators (KPIs) are important. For instance, the practice focusing on brand awareness would value page views, Facebook likes and follows and other similar data points. The practice focusing on increasing appointments would mainly look to website conversions for appointment requests as its main metric for success. Blog post for an orthopedic practice. 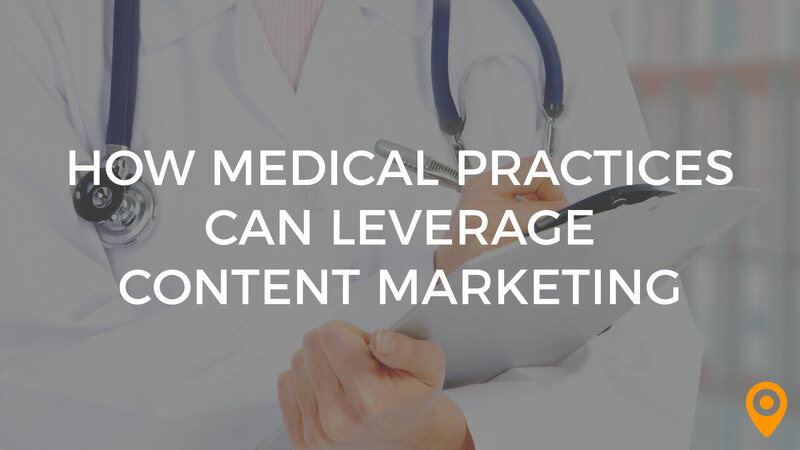 Medical practices have a chance to really shine when it comes to customized content. Primary care and specialty practices already know the common questions and conditions of the patients they see. Use your own knowledge base to create blog articles, videos or social media posts. It’s likely that others are seeking the same information, so your site will build authority and trust over time by tackling subjects that patients want to know. 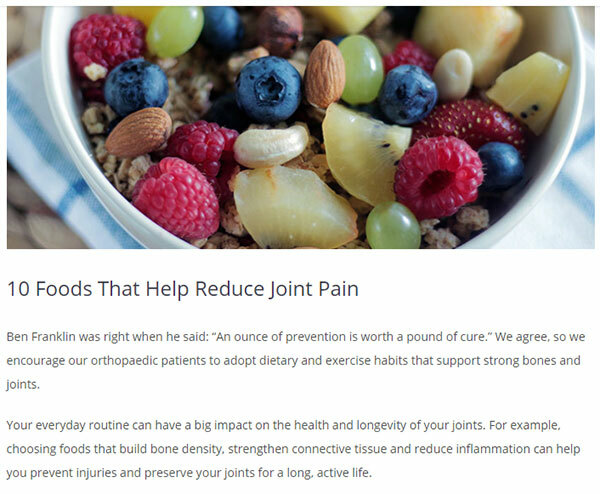 For instance, this orthopaedic practice created a blog post with a list of physician-approved foods that would help reduce joint pain – a subject that resonated well with its audiences and is one of it’s top performing posts. Other solid assets may be sitting right beside you – physicians and staff! Share profiles and personal stories, so patients can get to know the practice better. 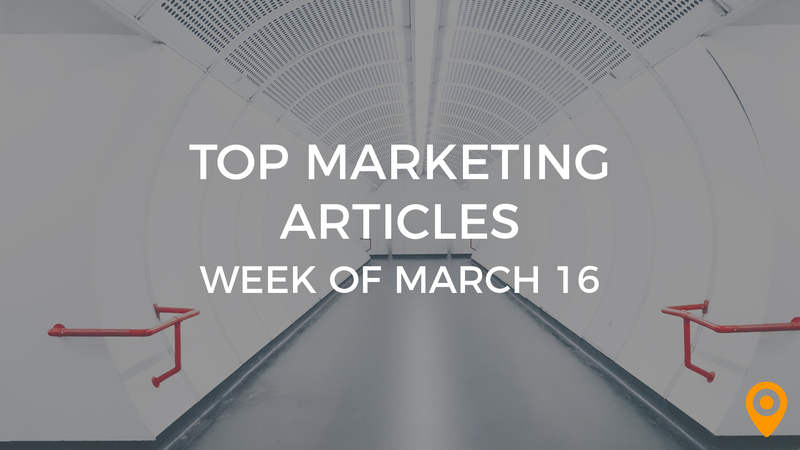 The most successful and shareable articles and blog posts present information in an easy-to-read format. Keep your paragraphs short and try not to exceed four lines for each one. Break up text with headings, bulleted or numbered lists, links or images. Ensure that your website is optimized for mobile use as well. It’s essential that you use a framework that encourages users to easily move on to other areas of your site, so users won’t immediately click the back button. When you collaborate with others to contribute to your content marketing initiatives, you’re proactively putting your content on the path to success. Patients, colleagues, universities, community organizations and a multitude of other people and businesses will want to share your content if they were involved in its creation or have a vested interest. For example, say a patient leaves an extremely positive testimonial on your Facebook page, it’s a great idea to reach out to that person and ask if you can share his or her story on your blog. If they agree, it’s original content with a personal success story from a patient. It gives you credibility and an enhanced relationship with the patient – plus they will share it within their social circles. A healthcare practice is a business where data matters, just like any other industry. Capture web traffic on your website with Google Analytics or another measuring mechanism, and keep track of your social media efforts via native analytics or a social analytics tool such as Sprout Social. Using the KPIs that you chose at the start of your campaign, gauge your success and adjust your content as needed. Amanda is a marketing professional that is equal parts creative and analytical. 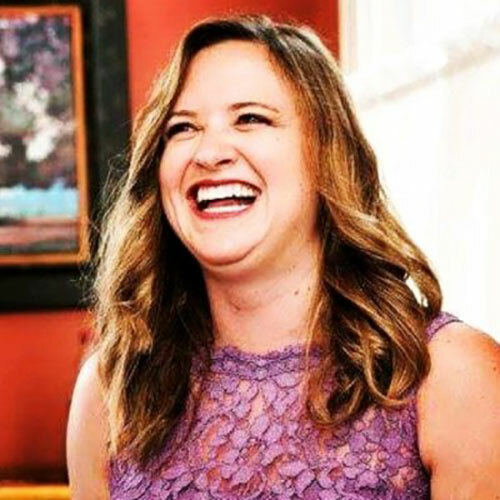 She crafts engaging content strategies and quality web experiences that help clients strategically reach their target audiences and get results. Her diverse agency background spans a multitude of B2C and B2B industries including healthcare, construction, real estate, hospitality and entertainment – just to name a few. An improviser by trade, Amanda is a quick on her feet and aspires to be at least half as cool as Amy Poehler.